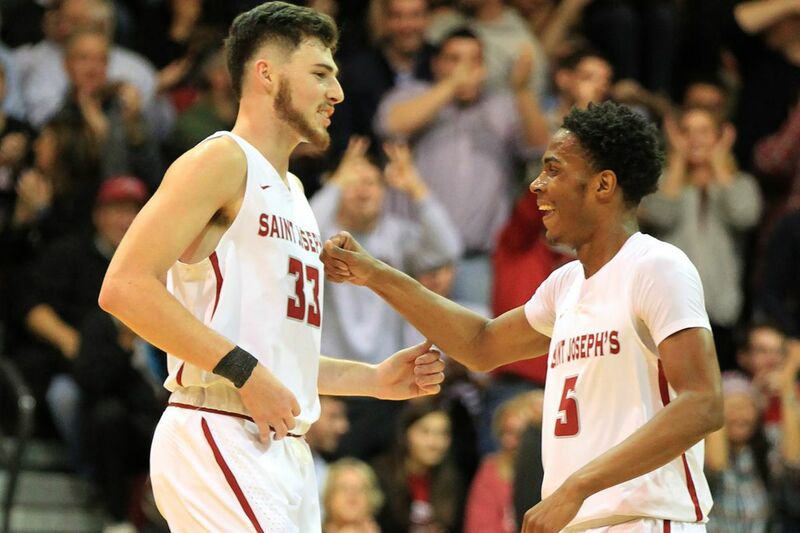 St. Joseph’s forward Taylor Funk (left) celebrates with teammate Nick Robinson on Nov. 18, 2017. Funk scored six of his 19 points in overtime. St. Joseph's outscored VCU by 24 points from the free-throw line Wednesday night, forced 20 turnovers by its opponent and led for the final 4 minutes, 8 seconds of regulation, but still had to go to overtime in its Atlantic Ten Conference home opener at Hagan Arena. Then it took one of the youngest players on the floor, freshman Taylor Funk, to carry the Hawks to the finish line. The 6-foot-9 forward, making just his second career start, accounted for six of his team-high 19 points in the extra period and led St. Joseph's to an 87-81 victory over the Rams. The Hawks (6-7, 1-1 A-10), who placed five players in double figures, recovered from a loss Saturday night at George Washington but coach Phil Martelli tempered his enthusiasm. "We competed tonight, we didn't do that on Saturday," said Martelli, whose son, Jimmy, the Rams' director of operations, sat on the opposite bench. "We played on Saturday but didn't compete. Tonight we competed, but I don't think we played very well. You can't miss layups. We competed, kept our turnovers down, played like we were the home team, but that wasn't an 'A' game." St. Joseph's made 29 of 38 free throws compared with 5 of 7 for the Rams (9-6, 1-1), who had a four-game winning streak snapped. Sophomore Nick Robinson got to the line 14 times, making 11, and scored 13 points. The Hawks, who led by 46-40 at intermission, shot just 29 percent in the second half but led by four, 75-71, with just under two minutes to play in regulation. The Rams' Jonathan Williams brought his team to within one with a conventional three-point play, then tied the game at 76 on a drive with 10.4 seconds left. After a timeout, St. Joseph's went for the win but Shavar Newkirk lost the ball out of bounds as he tried to drive the baseline. With 1.2 seconds left, the Rams threw a pass the length of the court that was deflected and grabbed by Justin Tillman (22 points 12 rebounds), whose swished three-point shot was confirmed on replay to have been released just after the buzzer. On the first possession of overtime, Funk hit three free throws to give St. Joe's a lead it would never relinquish. He later knocked down a three-pointer from the right corner with 1:39 to play to give the Hawks an 84-78 lead. "At the end of regulation, Shavar just mishandled it," Funk said. "But we came out and made some shots in the overtime, they missed some shots and the game went our way. That was a big win."